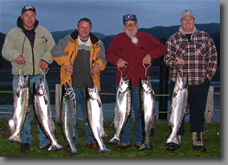 Escape To The Exceptional with David Johnson's Guide Service! 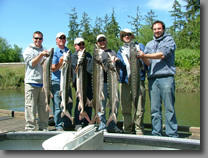 When you fish for Salmon, Steelhead and Sturgeon with us, you are giving yourself and your guests the very best guided fishing experience you can find on NW Oregon's beautiful waters. We put in the extra effort both on and off the water for you to have a memory of a lifetime. 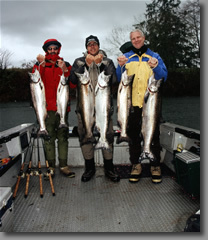 When you fish in our boats you will find safety, comfort, patience and skill. Using the highest quality boats, bait and tackle insures you the best chance of catching your fish at some of the best fishing locations anywhere. As the old saying goes, "you get what you pay for." You are going to get your moneys worth here. 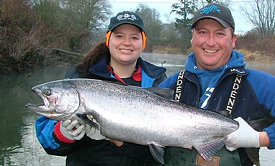 Come and experience what fishing in the Northwest has to offer. In 14 years of guiding David has had hundreds if not thousands of happy clients and you deserve to be counted as one of them too. Copyright 2007-2009 David Johnson's Guide Service. Web site created by Golden Stone Web Design.